For the body of work Feral: Rewilding Furniture, I collected discarded wood furniture, disassembled it all, and amassed a scrap heap of parts. I considered the pile as if it were a primordial soup of abandoned timber components, bubbling, cooking, reconfiguring, and self-assembling (with some help from me) into unlikely, mutated forms reminiscent of exotic flora and fauna. 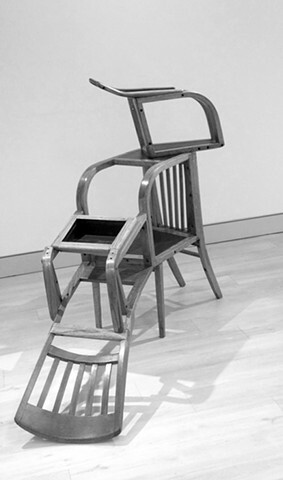 The structural mash-ups retain their DNA and genetic memory, evolving with intentions to be both living entities (like their arboreal ancestors) and functional objects (like their furniture predecessors). The resulting works strive to occupy domestic spaces and re-wild modern interiors, challenging Cartesian notions of order, utility, and the planned universe. * As a tongue in cheek reference to the Bauhaus, several of the works in the series are accented only with single basic colours including green, red, yellow, and in the case of the Criogriff, black. The name Criogriff is derived from utilising the etymologies of mythological hybrid creatures, making this mutant mash-up part eagle, part ram. This work is especially functional as an entry hall table or sideboard with its multiple shelves/surfaces, a removable box, and horn-hooks for bags and coats. Sculpture made useful. •	In the early 1600’s, Rene Descartes and Francis Bacon shifted interpretations of Genesis from notions around stewardship of nature into man’s obligation to tame, cultivate, harvest, and civilise wilderness. The notion of universe as clockworks prioritises linear systems and aspires to groom the world accordingly. Since then, Dominionism has justified damaging policies ranging from cultural assimilation and slavery to environmental degradation and escalating rates of extinction. Meanwhile, the workings of natural and indigenous systems, often extremely complex, holistic, and entangled, had little validation until recently. Recent findings—e.g. how trees communicate with each other through complex root/fungal networks—are now challenging past paradigms.